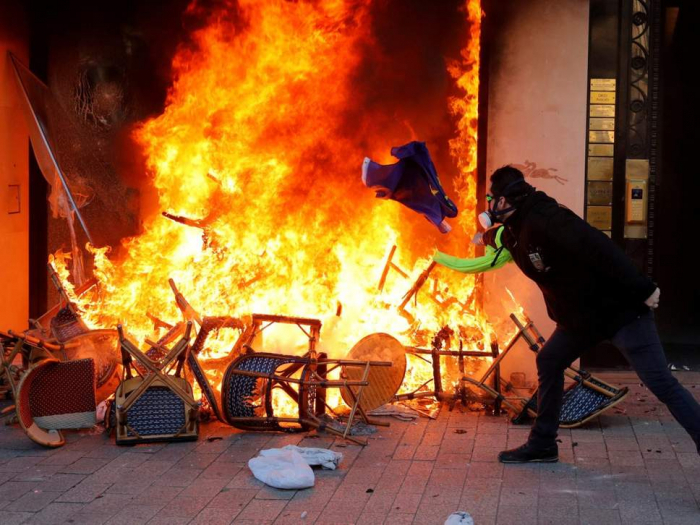 Emmanuel Macron‘s government has banned yellow vest protests from being held along Paris’ Champs-Elysees avenue, following riots on Saturday which left luxury stores burned and ransacked. Edouard Philippe, the French prime minister, announced the ban on Monday. “From next Saturday, we will ban ‘yellow vest’ protests in neighbourhoods that have been the worst hit as soon as we see sign of the presence of radical groups and their intent to cause damage,” he said in a televised speech. The ban will apply for an unspecified amount of time parts of Paris and also in areas of Bordeaux and Toulouse. All three cities have been badly affected by the anti-government demonstrations. Mr Philippe announced the new security measures following a meeting with Mr Macron and senior officials. Michel Delpuech, Paris’ police chief will also be replaced this week, following the recent unrest, the prime minister added. On Saturday around 10,000 people marched through the French capital. Shops and restaurants were set ablaze along the Champs-Elysees and a mother and child were rescued from a burning bank near the area. Protesters and riot police also clashed near the Arc de Triomphe. In his speech, Mr Philippe said around 1,500 of the protesters were troublemakers committed to “looting, destroying property and causing injury”. The French prime minister acknowledged there had been “dysfunction” in police operations on Saturday. He said police forces on the ground would be given greater initiative when working to disperse crowds and rioters in the future. Officers will also use drones and video surveillance to help prevent violence. The unrest began in November 2018, over a since-scrapped fuel tax hike, but the protests have since evolved to become an anti-Macron movement. In December Paris was hit by its worst riot in decades, which left hundreds of protesters injured. Some demonstrators wear the high visibility jackets which French drivers are required to have in their cars, a gesture which has given the protests its name.